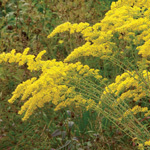 A compact plant that thrives on neglect in the right situations. 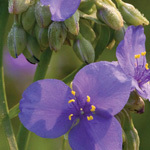 Dwarf spiderwort prefers well-drained soils and is similar in stature to woodland spiderwort (T. ernestiana). Unless the year is extremely dry, dwarf spiderwort remains green after it has finished blooming; woodland spiderwort always goes dormant for the summer. 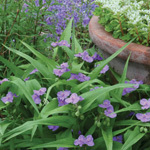 Spiderworts are great for pollinators, especially bees, and dwarf spiderwort is no exception. Our plants have a pinkish-purple blossom, but the colors vary naturally from pink to purple to white and occasionally blue.